Your landscaping can be modified to help prevent basement flooding. But don’t wait until it’s too late! We have seen how erosion can affect your property and how landscaping techniques can be used to combat it. 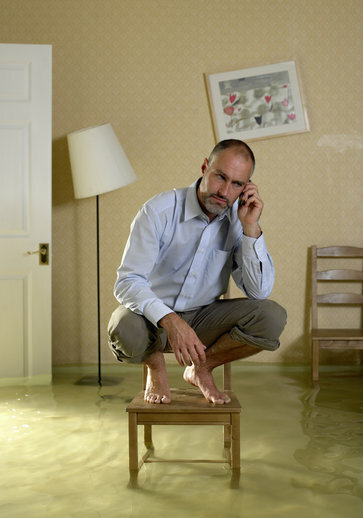 If you are having problems with your basement flooding easily, your landscaping may be making the problem worse. The land around your home is just as important as the building itself when it comes to basement flooding. Here are some landscaping techniques used to alleviate a flooding problem. If a lawn is steeped towards the home so that water flows to the home, this is an obvious problem that could contribute to basement flooding. The problem is usually remedied with a dry creek in the yard, or diverting the water to a pipe that flows away from the home. Experienced landscapers can also determine the path water is taking to reach your home and use glass barriers, if necessary, to divert water away from your home. Moisture can wick up from a bed of mulch. While this isn’t a problem for exposed brick or blocks, it can rot away siding which can leave your basement in danger of flooding. A good rule of thumb is to leave a 6-inch gap between the mulch and the siding. Keeping water as far away from the building as possible is key to preventing flooding. Direct downspouts about 20 feet away from the house and keep the gutters clear. If your gutters can’t keep up with the water volume, use decorative stones where the water hits to prevent erosion and other problems. Bottom line? Call us Atlantic Maintenance Group. We’ll have professionals out there quickly to take a look at your landscape, to make sure erosion isn’t wrecking your yard. If we need to, we can offer you plenty of solutions that will work for you. This entry was posted on Tuesday, September 20th, 2016	at 6:08 pm	and is filed under Erosion, Landscaping Design	. You can follow any responses to this entry through the RSS 2.0	feed. Both comments and pings are currently closed.